By the sink in my bathroom sits a small paper bag containing pills. Lomotil, they’re called. A gift from an American colleague’s wife. Thanks to them, I no longer need to visit the bathroom several times a night, every night. But the bugs are still sticking pins in my abdomen. I would eat something different for dinner, but beef’s really all there is. And if it’s the caipirinhas – well, forget it. I need the stress relief. Yes, I know, I’m in Rio, but it’s no holiday. Most days I’m out at the swamp – sorry, exhibition centre – well before 7 am, ready for another day brimming with challenges. ‘Watch out!’ He yells. But it’s too late. Taxi drivers gather. Someone winkles me out, reverses the car into the hotel car park. The almighty bang that shot me sideways – yes, I was wearing my seat belt – hasn’t done any permanent damage to me. Just to the Beetle. But my already fragile morale shatters into a thousand pieces the moment the sympathy starts. Tears flow like British summer rain. My shoulder hurts a bit, but my ego hurts a lot. I wasn’t insured to drive the Beetle (I didn’t know). Accidents have to be reported, in person, by the driver, at the police offices. A vast pool of witnesses saw me drive out into the traffic looking the wrong way. I’m just a British female. Not a memorable, girl-from-Ipanema female. Sandra has the same colour hair as me. Sandra queues, reports the accident. Saves my bacon. Which is yet another reason why, sitting around the pool on a welcome Sunday off, I’m staring at her in admiration. She’s so cool, so calm, so – different from me. And she’s organised a visit from a gem dealer. I gawp at emeralds. She buys them. I gave my mum the teardrop shaped one, she never had it mounted. A jeweller in Shaftesbury, Dorset, turned the triangular one into a silver ring which became known as ‘the ring of power’. Worn at important meetings, it was supposed to boost my confidence. 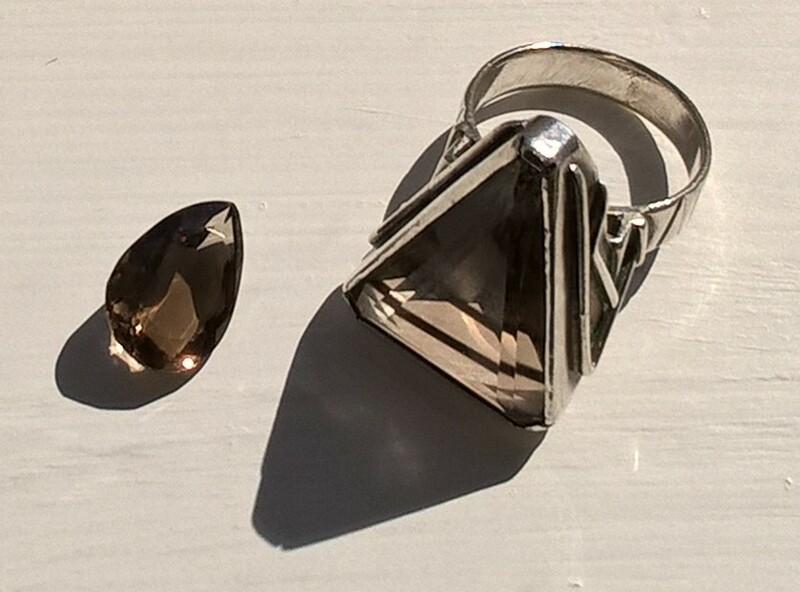 I buy some pretty smoky quartz. Beautifully cut (I’m told). And cheap. We visit a hippy market. I buy a sarong made of coarse, tie-dyed cotton. I also buy a wooden sculpture of Jesus. I think it’s the sun. Or maybe the shock, lingering. One thing at least is working out well. What with running around the site, the tummy bug and dawn swims, I’ve lost a load of weight. Guys at the exhibition are chatting me up. One’s rather nice. I accept an invitation to dinner. At a very smart restaurant. Top floor of a tower, view of a world-famous beach at dusk. Pudding comes with a sparkler – I’ve never seen anything like it. But then I make a big mistake. I go back with him to his hotel. Suffice it to say he’s expecting payback for the fancy meal. Doesn’t get it. Sends me back across Rio, alone, in a taxi. Apparently no-one sends foreign females home alone in taxis. But I survive. On safer ground, I make a new female friend, from the Boston office. Let’s call her Betsy. We get on really well. So well, she confides something really very personal. You see, I’ve had quite a sheltered upbringing. Apart from a girl who lived across the corridor from me at university, who barged in one day telling me she’d ‘got the clap’ (and her boyfriend telling me what the doctor did to him), I’m not really familiar with what they call venereal disease. Or in this case, not disease, but – well, not to hedge around it any more – crabs. I didn’t know about crabs. Now I do. Anyway, Betsy has had the treatment and now she’s clean. Or whatever you say when you no longer have crabs. She helps me buy some shoes – mine don’t let enough air circulate round my purple feet, apparently. I find a pair of with just enough leather strapping to hold high-heeled wooden soles to my toes. The extra height makes up for the ignominy of flaky violet feet. And they come in useful when we fly back to Boston. Betsy invites me to stay at her upside-down house on a river. I have no casual clothes, so borrow a pair of jeans. Betsy’s taller than me and the new shoes compensate for my shorter legs. We go shopping. Eat lobster. Have a riot. I sleep upstairs, on the sofabed. Day three, her jeans lying on the floor beside my bed, I hear a wail coming from the bathroom. The crabs are back. And I’ve been wearing her trousers. You know what imagination does. Just think about nits and wait for your scalp to itch. But by the time I’m back in London, when it’s plain I escaped the wee beasties, something else is amiss. I wake every night, sweating and cold. Have no appetite. My doctor diagnoses exhaustion – and possibly malaria. Gives me two weeks off work. My editor in Boston thinks I’m malingering. He wasn’t there, doesn’t know how bad it was. Soon, it doesn’t matter what he thinks. Those nice folks from Philips, the ones I met in Rio, invite me out to play. Offer me a job in the Netherlands. Always expect the unexpected. Who knows, it just might happen. Or, in the happy case of the crabs, it might not. This entry was posted in Travelling and tagged accident, beef, Boston, caipirinhas, crabs, Jesus, Lomotil, Rio de Janeiro, smoky quartz, tie-dyed sarong, VW beetle. Bookmark the permalink. Ha! Nits always does it. Glad you ‘enjoyed’ it. I didn’t. Several lessons learnt there! Wow ,what a dangerous life you led ! Led? 😉 Little did you know, eh?